Racing Beat-designed front and rear anti roll bars reduce chassis roll during cornering and increases your car’s sensitivity to steering inputs, thereby improving maximum cornering power. Substantial engineering effort, select steel alloys, and precise manufacturing processes are combined to produce top performance components. All Racing Beat roll bars are finished with a distinctive, red powder coating that provides a smooth, glossy protective layer. You can be assured of many years of superior handling performance with these proven bars! Front Sway Bar The diameter of the RB front tubular bar is 1.25" (32mm) x .1875" wall thickness, as compared to the stock 1.05" (27mm) x .134" wall thickness front bar. An additional feature of the front bar is a pair of OEM style "stoppers" to prevent the bar from sliding sideways in the bar bushings during heavy cornering effort. Rear Sway Bar The diameter of the rear tubular bar is .75” (19mm) x .125” wall thickness, as compared to the stock .632” (16mm) x .097” wall thickness rear bar. An additional feature of the rear bar is a pair of OEM style "stoppers" to prevent the bar from sliding sideways in the bar bushings during heavy cornering effort. Both bars are supplied with replacement urethane bushings, Prothane grease and installation instructions. The original OEM bar clamps are retained for use with the rear bar, while the Racing Beat supply beefier clamps for use with the stiffer front sway bar. 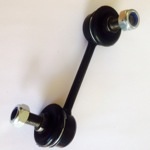 Please note optional adjustable rear Racing Beat end links are also available in the shop. 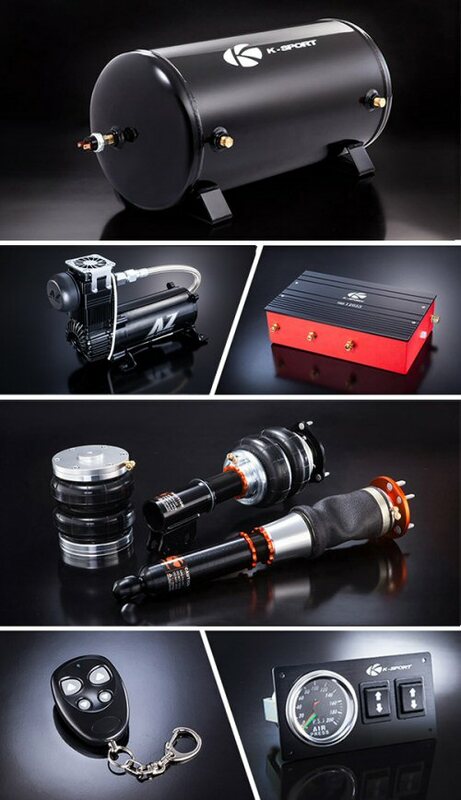 Please allow up to 21 days for delivery of these parts as UK stock levels can change quickly. Racing Beat designed coil springs are suitable for street or racing applications. Designed to offer a modest reduction in ride height, these linear rate springs interchange exactly with the stock springs. 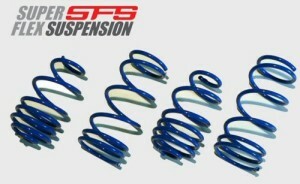 These RX-8 springs will provide a front and rear drop of approximately 25mm (1/2-inch) drop both front and rear. A modest spring rate increase of approximately 20% will provide a performance improvement without sacrificing ride quality. “Springs are very much a matter of opinion, I adjust ride height and spring rate based more than any other thing, my taste. We won't excessively lower a car to obtain a "look". First, the car will hit the bump rubbers far too often and that makes the car unpredictable in its handling, also it makes it harsh and it is very hard on suspension components causing them to potentially fail. We therefore make relatively small changes in ride height, usually less than 1", depending on the application. We adjust that based in part on what we perceive the best way of adjusting for good handling. Our primary goal in lowering the car is handling, and from our point a view, improved appearance is a side benefit. We don’t lower the car for appearance, and then take what comes in handling. We are very cautious to not excessively lower the car such that it will cause perceived problems either in safety or unreasonable changes in ride comfort." Eibach's RX8 Pro-Kit lowering springs are the perfect answer for most frequently-driven street cars. It’s their legendary spring system that dramatically improves both a vehicle’s performance and appearance. Pro-Kit lowers your RX8's centre of gravity, reducing squat during acceleration, body roll in corners and excessive nose-dive under braking. When combined with Plus-1 or Plus-2 wheels and tires, the Eibach Pro-Kit is the finishing touch to a winning recipe for performance in your RX8. Pro-Kit also reduces excessive fender-well clearance, making your RX8 look just as hot as it performs. 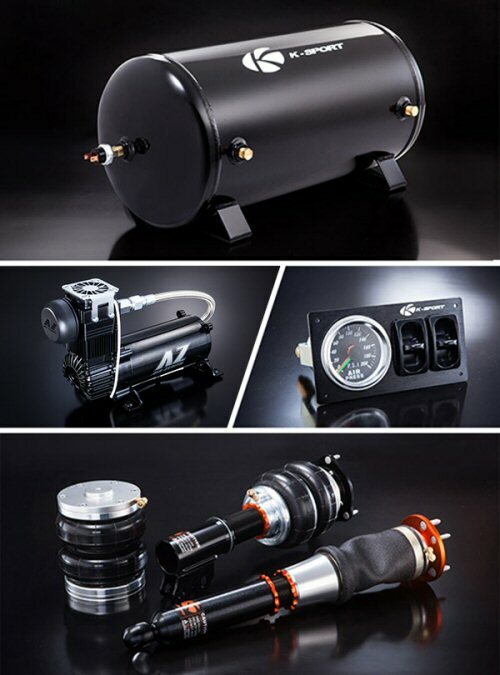 Every Eibach Pro-Kit is designed and tested by Eibach suspension engineers and performance driving professionals to deliver aggressive good looks and high performance handling, without ever compromising safety or ride quality. Eibach's proprietary, progressive spring design, the RX8 Pro-Kit provides the ultimate balance to take your passion for driving to a whole new level. TEIN S.Tech Springs are an excellent step towards suspension tuning. They offer approximately a -30mm Front and -25mm Rear drop for a more aggressive appearance and increased road holding capability. 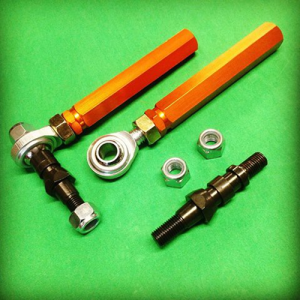 High quality OE spec anti roll bar (ARB) drop link/end links to fit your RX-8. These drop links are stronger than the standard Mazda design with a superior ball joint at each end, the superior ball joints should prevent premature failures of these drop links that are so prevalent in the OEM Mazda design. Application and correct part selection. Front drop links are handed, this means it is important to select the correct part to replace your failed link for example a left drop link will not fit on the right side, please use the images below as a guide. Rear Drop Links are not handed so the same rear drop link will fit either side of the vehicle. Image for illustration purposes only actual product may vary in design from that pictured. Price is for 1 drop link including fasteners. Please select your correct application from the drop down menu beside the price. 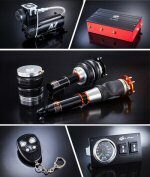 The brand new entry level coilover from Tein has proven extremly popular. With an even lower price then Teins Street Basis Coilover, once again Tein have delivered on price without compromising on quality. 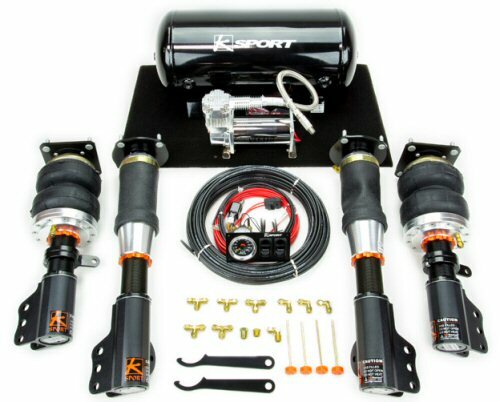 One of the ways Tein have managed to shave the price of this kit is to utilise the OEM top mounts. Some of the features of the new Street Basis-Z include. Sealed Structure The top end of the shell pipe is narrowed, oil and gas are injected, and the whole unit is sealed by crimping the metal. This new approach massively shortens the production process. As a result, we have succeeded in vastly cutting production cost. Thread Type Ride High Adjustment The ride height can be adjusted by moving the lower spring seat up or down. Characteristic of this system are its simple structure and ease of use. Twin Tube System Compared to the regular mono-tube system, twin-tube attains longer stroke with a smaller repulsive force, resulting in high ride comfort. Roads may have all sorts of surface conditions. This calls for shock absorbers with ample stroke, that operate smoothly.Thanks to this unique characteristic, you can negotiate gaps and bumps steadily on rough roads, meaning a smooth ride at low speed and stability at high speed. Use of OEM topmounts. STREET BASIS Z use the vehicle's original upper mounts (not included in our product kit). High Durability and Reliability are what make the Tein Street Basis-Z a great choice if your on a budget. Optimal Dust Boot Thanks to its smooth compression and high durability, the dust boot guards the piston rod from damage, and keeps foreign material out of the shock absorber. (Some vehicles use their OE dust boots) No Sag Springs Cold formed with SAE9254 steel (minimum tensile strength 200 kgf/mm2), our springs are outstandingly sag-proof and boast extreme resiliency.Superior rust protection is ensured with a highly durable powder coating that does not peel or flake. Our high-quality springs can be used without worries, in any conditions. High Performance Damper Oil Since TEIN's damper oil maintains a stable viscosity in a broad temperature range, it sustains smooth stroke and reliable damping force in a variety of circumstances. Due to excellent anti-foaming properties, it's resistant to cavitation (bubble forming). Since it withstands high heat too, it's suitable for intense sport driving as well. Furthermore, the damper oil keeps up its superior performance long-term, because it's resistant to deterioration over time. Tein's brand new top line coilovers for the RX-8 are now the Mono Sports, this top end coilover kit from Japanese suspension specialist Tein is focused on circuit driving performance and feedback without turning their back on those that really want to use them on the street too. The Cusco Anti Roll Bars replace the factory ARB, (if equipped) and uses the factory mounting locations. The Cusco ARB will dramatically reduce body roll since its stiffness is greater than the factory bar or if the vehicle is not equipped with one. The larger diameter and steel strength bar give the Cusco bar more resistance against torsion, which helps keep the vehicle stabilized during cornering and reduces weight transfer. This kit includes replacement rubber bushings and new clamps if needed Essex Rotary recommend replacing your droplinks at the same time as your ARB as many of the OEM links are very difficult to remove in our experience. Also Available in and front and rear kit (that include a new set of our OE spec drop links) at a fantastic saving. Please allow up to 28 days for delivery when out of stock. Essex Rotary recommend replacing your droplinks at the same time as your ARB as many of the OEM links are very difficult to remove in our experience. Also Available in and front and rear kit (that include a new set of our OE spec drop links) at a fantastic saving. Please allow up to 28 days for delivery when out of stock. Save over £60.00 when buying this excellent CUSCO front and rear anti roll bar kit with drop links for your Mazda RX-8, this kit is available at a massive saving over buying them individually and also includes a set of our high quality OE spec replacement drop links just to make thins that little sweeter and easier top install. Front ARB is 28mm tubular construction and rear ARB is 18mm solid construction, also included are 2 front ARB drop links and 2 Rear Drop Links with an individual value of over £100 alone. Essex Rotary recommend replacing your droplinks at the same time as your ARB as many of the OEM links are very difficult to remove in our experience, this is why we have bundled the drop links in with this great package. 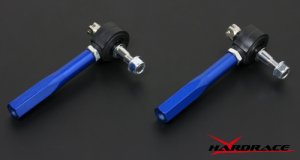 Hardrace has developed reinforced and adjustable control arms to accommodate the needs of the aggressive and performance oriented tuner. Being constructed of a Lightweight Steel-Alloy which is able to withstand the stresses of extreme competition, these arms are powder coated with a 3-Stage process to ensure durability and protection against the elements. Please Allow up to 28 Days for delivery of your parts. It is within this understanding that Hardrace has unveiled our line of reinforced suspension arms that offer the strength and adjustment that any competition vehicle will ever need. 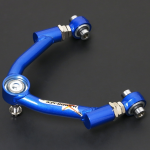 Constructed of high-strength steel alloys that offer durability, strength and yet remain light-weight, these control arms have been track tested for months in road race, autocross and drift events to assure quality and performance. Please allow up to 28 days from the time of ordering for these parts to be delivered. Please Allow up to 28 days for delivery of these parts. Rear alignment is absolutely crucial when modifying your car. Alignment can effect every aspect of your driving experience, from straight line stability, under steer, over steer, acceleration, braking and tire wear. Although stock components allow slight alignments from the stock suspension settings, they often are not able to properly align the car after the suspension has been modified. From the factory, most cars are set to have under steer and for optimum tire wear at stock height; under steer is often undesired from a performance standpoint and almost all performance driven applications are lowered. These Adjustable Links from suspension specialist whiteline are an ideal upgrade. 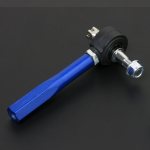 Roll center tie rod end made with high quality alloy steel. These tie rod ends are designed to have maximum accuracy, which enables them to sustain extensive load. Uprated and Lowered Coil Spring Kit. Please note these will not fit vehicles equipped with Bilstien dampers such as the PZ edition. 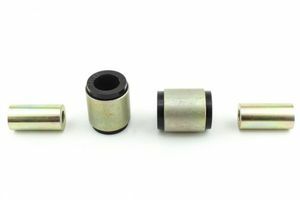 These pillow ball tie rod ends from Japanese Tuners Super Now will help correct your steering geometry and reduce the possibility of bump steer when you lower your car. When lowering your car you are effectively changing the angle of all the suspension arms, this includes the tie rods on the steering rack. If your steering rack arms are not aligned properly it can cause subtle issues. 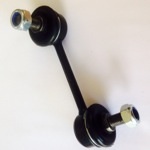 These Super Now Tie Rod ends are designed to be adjustable and can correct the steering rack geometry. Made with high quality components it is worth nothing that open pillow balls will require extra maintenance when compared to OEM joints. We have put together a Powerflex front suspension package for your RX-8 using the Powerflex Purple Series bushes for road use. This kit consists of the following bushes. We have put together a Powerflex rear suspension package for your RX-8 using the Powerflex Purple Series bushes for road use. This kit consists of the following bushes. We have put together a Powerflex front suspension package for your RX-8 using the Powerflex Black Series bushes for track use. These Black Series bushes are stiffer than their purple series and aimed at track use as they may transfer more vibration through the car. These bushes from Whiteline replace the stock ones found in the front lower control arm (often referred to as the wishbone) These bushes are not available from some other manufacturers like Powerflex. Shock absorber advances and demands for improved travel and load bearing has placed extra importance and stress on shock absorber bushings. Whitelines superior formulation shock bushings enhance the performance of new and used shock absorbers. Possibly the best value for money ARB kit your going to find. This Package offers a huge saving over buying everything individually. Engineered to 'Activate More Grip', Whitelines Front and Rear RX-8 AWB/Sway Bar Kit is a packaged solution designed to improve performance and enhance the driving experience of your vehicle. 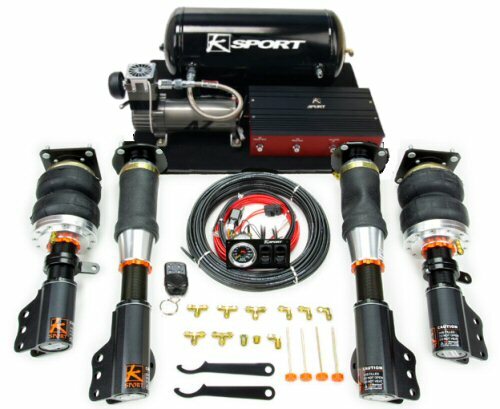 Boasting a 27mm 2 point adjustable front sway bar and 18mm 2 point adjustable rear sway bar, the kit is completed with high quality sway bar links and mounting accessories that ensure optimum performance and ease of installation. Achieve perfect balance and precise tuning with this Whiteline Sway Bar Kit.